Posted in: BSU Journal Club. Tagged: close-in exoplanets, Kepler mission. Artist’s impression of planet alignment in 2016. From here. Anyone who’s done some stargazing has probably noticed that the Sun and the Moon appear along nearly the same arc in the sky. This Sun’s arc, called the ecliptic, corresponds to the plane of the Earth’s orbit. Since all planets in the solar system share nearly the same orbital plane, they likewise hew close to this arc. It turns out that the ecliptic also coincides closely with the Sun’s equator. The near alignment of all planetary orbits in the solar system is one of the most important clues to their formation – the solar system originated billions of years ago from a thin disk of gas and dust girding the young Sun’s belly like a hula hoop, an idea going back at least to Immanuel Kant in the 1700s called the Nebular Hypothesis. Once it was accepted, this idea was so successful at explaining and predicting features of the solar system, astronomers believed all planetary systems in our galaxy would resemble our own – with small, rocky planets close to their stars and large, gassy planets farther away, but all sharing the same orbital plane. The discoveries of thousands of exoplanets have turned all that on its head – planets around other stars have orbits oriented every which way. For example, the Upsilon Andromeda system has three Jupiter-like planets, all on orbits that are widely misaligned. Although these topsy-turvy planetary orbits were initially puzzling, astronomers are starting to tease out the explanations for these systems. Planets probably do start out in well-aligned orbits, but, like kids in the backseat on a long car trip, jostling between the planets (due to mutual gravitational tugs) soon upsets this delicate arrangement and upends the orbits. In the case of Upsilon Andromeda, planets may even have been ejected from the system. A recent study from Fei Dai and colleagues explored connections between orbital misalignment and the origins of one puzzling class of exoplanet – small, short-period planets. These planets range in size (and probably composition) from Neptune-like to smaller than Earth but inhabit orbits very close to their host stars, some taking only hours to circle the star. Many of these short-period planets also have sibling planets farther out, and the arrangement of these orbits might tell us how the planets got so close to their stars. As for the Upsilon Andromeda system, the mutual inclination between the orbits, if its big, may point to a history of violence in the system. Such violence may explain how the short-period planets got so close to their stars – they could have started out far away and been thrown by their siblings toward the star. By contrast, a small mutual inclination could mean the system has always been relatively quiescent, and the short-period planets may have gently migrated inward from farther out. 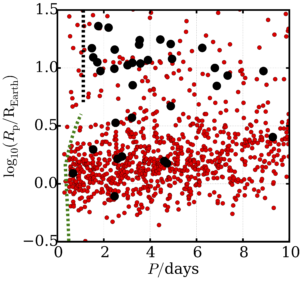 By analyzing the transit light curves of the planets as observed by the Kepler spacecraft, Dai and colleagues found a pattern in the mutual inclinations for these systems. 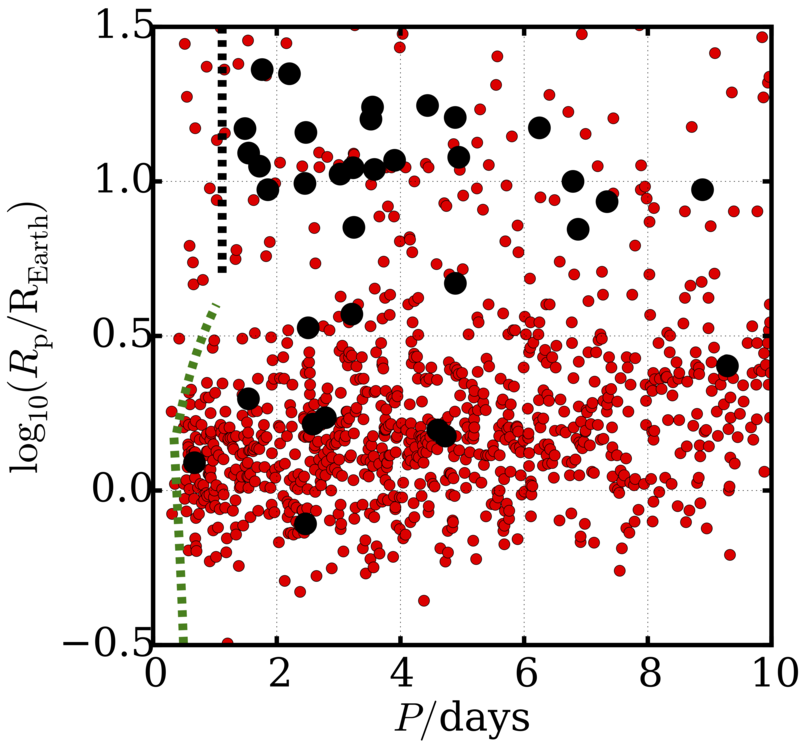 From their paper, the figure below shows that when the distance of the shortest-period planet in a system a/R* is larger, the mutual inclination ΔI between orbits tends to be less widely distributed. Figure 3 from Dai et al. (2018). What does this result mean? Since the short-period planets closest to their stars (small a/R*) also seem to have a very wide range of mutual inclinations, maybe they experience the same kind of gravitational jostling that took place in Upsilon Andromeda, while planets farther out, they were moved in more gracefully. Taking a wider perspective, evidence is mounting that, while planetary systems are common in the galaxy, our own solar system is unique in many ways – there’s really no place like home. Posted in: BSU Journal Club. Tagged: close-in exoplanets. Posted in: Brian's Presentations. Tagged: close-in exoplanets, exoplanets, Kepler mission. Posted in: BSU Physics Seminar. Tagged: close-in exoplanets, dust devils, Kepler mission. Posted in: Journal Club. 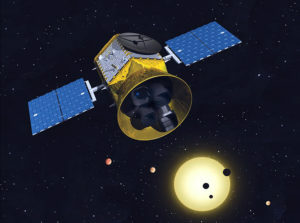 Tagged: close-in exoplanets, KELT survey. The radii Rp and periods P of KELT-16 b, along with lots of other short-period planets. From Oberst et al. (2017). There’s a new paper from the KELT Survey and led by Prof. Thomas Oberst from Westminster College announcing the discovery of another exoplanet in a very small orbit, nearly skimming the surface of its host star: KELT-16 b is a highly irradiated, ultra-short period hot Jupiter nearing tidal disruption. These planets have been something of a puzzle since the first was discovered back in 1995. Like Jupiter, they are mostly made out of hydrogen and helium gas, but unlike Jupiter, they orbit very close to their host star, which probably means they didn’t form where we see them today. Even among hot Jupiters, though, KELT-16 b is an outlier. It’s one of a handful of hot Jupiters with orbital periods less than 1 day (as compared to Jupiter’s orbital period of 12 years), so whatever processes led to its origin are cranked up to 11 for KELT-16 b and its ultra-short period siblings. 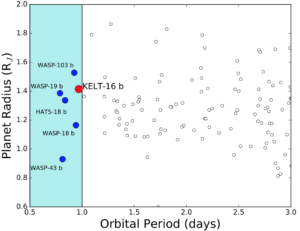 The mystery of its origins aside, its short period means KELT-16 b is probably a good candidate for follow-up observations of its atmosphere, particularly by the James Webb Space Telescope. But tidal interactions with its host star means it may get eaten by its host star in less than a million years, so we need to get those observing proposals submitted soon. Posted in: Journal Club. Tagged: close-in exoplanets. 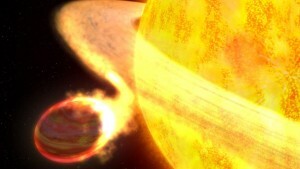 A hot Jupiter being ingested by its host star. From http://sen.com/thumbs/1024×576/img/47b3082d767346e8bebdb5ad99f8f33d.jpg. Since astronomers have discovered hundreds of planets orbiting perilously close to their host stars over the last few decades, the question of what happens to planets when they wander too close to their host stars has intrigued astrophysicists. These so-called close-in planets zip around their stars in just hours and are so close to their stars that the starlight heats their surfaces and atmospheres to thousands of degrees. Since the planets’ atmospheres are so hot and puffy, the planets have only a tenuous gravitational hold on them, and some planets have been observed losing their atmospheres. I myself have made a hobby over the last few years of ripping apart exoplanets in the computer and of looking for their fossils in the sky. How long it takes these hot Jupiters to lose their atmospheres and what’s leftover after the atmospheres are gone have been the subject of speculation for a while, and key to answering these questions is understanding what happens to the planets’ radii (and thus, their gravity) and what happens to the escaping mass. A recent study by Shi Jia and Hendrik Spruit explores a new aspect of this Roche-lobe overflow process, and their results suggest the atmospheric disruption process might happen a lot faster than astronomers have thought. 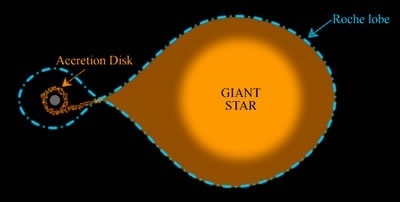 Accretion disk formation for a binary star system. Previously, it had been assumed that, as a planet’s atmosphere is ripped away, it goes streaming down toward the host star, and the gas then goes into its own orbit close to the star, forming what’s called an accretion disk. This process has been studied for decades in binary star systems, in which one star donates mass to their other. This accretion disk can then interact gravitationally with the disrupting planet, pushing it back away from the star a bit and moderating the rate at which mass escapes from the planet. The upshot of this is that formation of the accretion disk can slow the disruption process, and so it could take billions of years for a Jupiter-mass planet to lose its entire atmosphere – a long time on human timescales but relatively short on astronomical timescales. 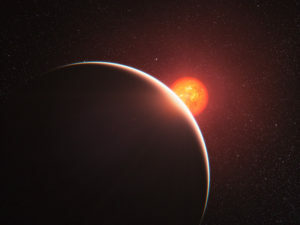 However, in their study, Jia and Spruit point out that these hot Jupiters undergo disruption very close to their host stars – so close, in fact, that, between the planet and the stellar surface, there might not be room enough for an accretion disk to form at all. Instead, gas that escapes the planet might just crash directly into the host star. That’s a problem for the planet because if there’s no disk around, it can’t slow the mass loss rate, and so the planet might shed its entire atmosphere not in billions of years but just a few weeks – less time than it would take me to explain the process during a semester of astrophysics class. Although the disruption process might be very fast, Jia and Spruit’s results suggest the remnants might be left around to be observed. What exactly they look like is still unclear, but the K2 and upcoming TESS missions will probably find lots of them (and may already have). Posted in: Brian's publications. Tagged: close-in exoplanets, Kepler mission, orbital dynamics. Planetary radii and orbital periods for planets (black circles) and planetary candidates (red circles) discovered by the Kepler mission. The dashed curves shows how close different planets can get to their host stars before they would be tidally disrupted. Taken from Jackson et al. (2016). Exciting news – just today, my research group had another paper accepted for publication, so we’ve added one more tiny brick to the edifice of human knowledge. This paper explored tidal disruption of gaseous exoplanets. Over the last few decades, astronomers have discovered thousands of planets outside of our solar system, so-called “exoplanets”. 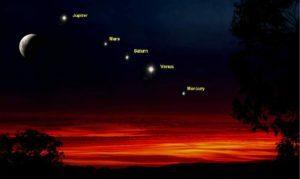 Most of the planets do not resemble planets in our solar system, and owing to biases in the way we find the planets, many of them are big, gas balls like Jupiter but orbiting much closer to their host stars than planets in our solar system – these planets are called “hot Jupiters“. The figure at left shows how close some of these planets are to their host stars. Many of these hot Jupiters are doomed to spiral in toward their host stars, and when they get too close, the star’s gravity can rip them apart in a process called “tidal disruption“. In our recent paper, we studied that process to try to understand how close a planet can get before it’s ripped apart and what might happen as it’s being ripped apart. The upshot of our study is that planets might get ripped apart a little farther from their stars than is often assumed BUT that ripping-apart process might proceed fairly slowly, over billions of years.